It has been more than a few years since my last serious weight loss transformation and I’m ready to get back at it. Yes, there have been numerous attempts to reboot the process since that time, but none of those attempts seemed to stick for long. Regardless of the reason, I chose to stop working out and eating right. As a result, I gained weight. At first, I enjoyed eating whatever kind of foods that I wanted, but eventually, I couldn’t consume terrible food without feeling guilty. First, I don’t want a heart attack, stroke, diabetes, or any other condition that can be prevented with better choices. Second, I knew that as I ate the comfort food, it was adding to my waistline and overall weight. As I write this article, I currently weight around 245 lbs. At one point in my life, I’ve weighed as much as 280 lbs and as low as 212 lbs. Of course, this was as an adult. Because I’ve done it before, I know that I can lose the weight again. The answer rests with my habits and strict adherence to a meal plan, daily cardio, and weight training. In the past, while making huge strides, I recall packing 4 to 6 meals each day and eating every few hours. It was a combination of fish, steak, or chicken with rice, sweet potato, and broccoli. For breakfast, it was oatmeal with 6 eggs (2 whole eggs and 4 egg whites). My cardio session was 20 minutes long, twice a day, followed by a rigorous weight training session that focused on a single body part at least 5 to 6 days a week. It didn’t matter if I was on a cruise ship, in a hotel room, at home, or away, I always prepared to follow the aforementioned plan of action. As a result, I lost a lot of weight. I remember losing so much weight that everything I wore looked way too big for me. It was as if I was wearing my father’s outfit or something. That’s more of a joke since the fact of the matter is that I’m actually taller and bigger than any of my dads. Just putting that out there. At one point, my success was so evident that I’d get questions often about what I’m doing. I would explain my meal plan, workouts, and offer any advice I could to people. I remember feeling accomplished, confident, and full of energy. It was a good time in my life. There was even one point where I was running my hands up and down my stomach in pure amazement. I couldn’t tell you the last time my abs felt that tight and it actually shocked me. With all of that progress, why did I stop? From what I can remember, I eventually reached a weight where I felt comfortable. In actuality, I should have kept going since I still had some fat around my lower back and abs. However, since I finished a successful 12-week sprint, I wanted to transition to a four-week bulking program. That switch in programs threw me off big time and I ended up enjoying that average weight for a while. If I gained weight, my clothes were going to be my last line of defense. Unfortunately, I started allowing those poor habits to return and the weight found its way back up the scale. I told myself that I wouldn’t buy any larger clothes. If I gained weight, my clothes were going to be my last line of defense. Well, people, my clothes are screaming at me. There are some nights that my pants leave itchy impressions in my skin because it’s so tight (mainly around my waistline). As I look in the mirror today, my abs are gone and it has been replaced by a protruding bulge around my waist. The fat belly hangs over my belt most noticeably in the front and sides. P.S., the love handles are the last thing to go. They are so not attractive! In my estimation, I look soft and round. My face and stomach are key indicators of weight gain. 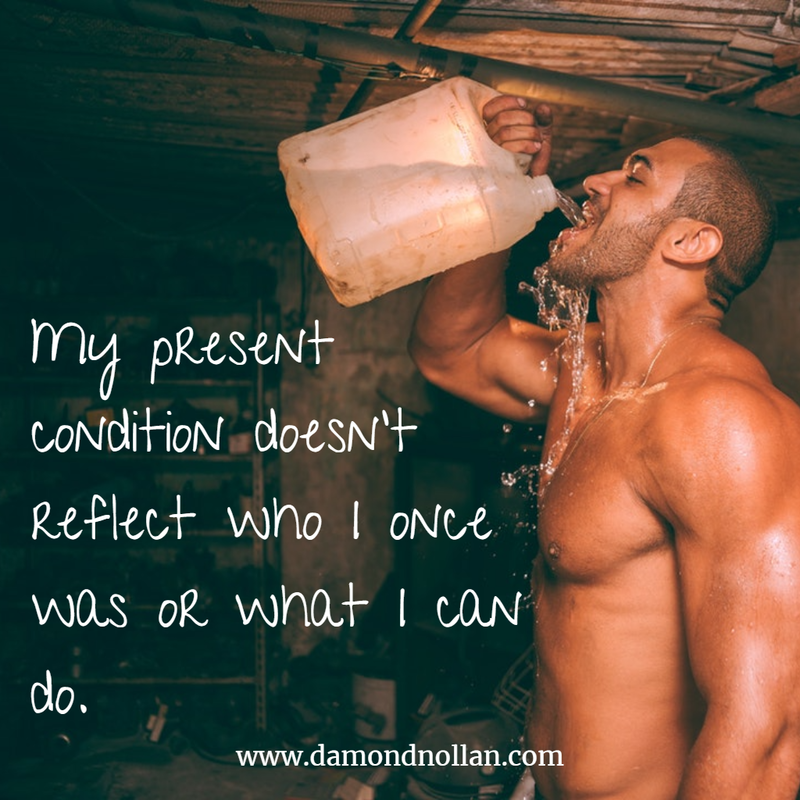 While I know that I can lose the weight and pack on the muscle again, my present condition doesn’t reflect who I once was or what I can do. The only evidence that I have is some old pictures and the memory I hold in my head. I remember what it felt like to win and I know that I can feel it again. At this stage of my conditioning, I’m not looking at my body much. Sure, I see what comes out of the shower, but I don’t pay it much attention since I know that I have some serious work to attend to. 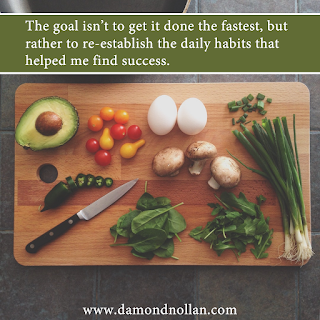 Instead, my focus is on building the habits that will lead to long-term success. I know that I have to change my eating. I also know that I have to increase my cardio and weight training activity. Unfortunately, I also know that if I go too fast, I’ll eventually quit because I’m too sore or I’ll start missing meals and workouts. Knowing this, I went into this season slowly. I want to focus on the habit of daily disciplines. Until I can get this under control, no amount of willpower will keep me in the game for long. Eventually, I’ll make excuses and start missing key activities. Having written that, let me share with you my strategy. This is something that I’ve done successfully in the past and it has become my goto strategy for any major change I make in my life. There is something extremely motivating when I get in the gym and can see my muscles flexing, veins popping out under controlled stress, and a massive influx of testosterone through my body which makes me feel unstoppable...animalistic. In the case of weight loss, I know there is the meal plan and the physical activity. I have to get both sides under control if I’m going to see any real progress. Doing one without the other leaves disappointing results for me. While I can adjust my eating and lose the weight, there is something extremely motivating when I get in the gym and can see my muscles flexing, veins popping out under controlled stress, and a massive influx of testosterone through my body which makes me feel unstoppable...animalistic. Honestly, I don’t know if it’s actually testosterone but you get the picture. It’s the pump, it’s the blood, it’s the body that feels amazing after a good workout. That feeling often influences what I do in the kitchen. If I want to see more gains, I change my habits in the kitchen. They are related. How do I begin? You ask. I begin slowly. Let me explain. At the beginning of any new sprint, I tend to do the bare minimum. In the case of weight loss, I tend to start by doing one exercise, one session of five-minute cardio, and I eat one controlled meal. That’s it! Sure, it feels funny to walk in the gym and leave only minutes later, but I have a game plan and I don’t let people’s stares deter me. For that first week, my goal is to simply make it easy to do the right thing. It’s easy to walk for 5 minutes on the treadmill or stair machine. It’s easy to do one exercise a day. It’s easy to eat one healthy meal a day. That’s the point, you have to make it easy. With that written, even though it’s easy to do, it doesn’t always mean I’d do it. Sometimes, my mind would say, it’s so easy that you can miss today and double up tomorrow. While true, the point is to establish daily disciplines and habits. So, while I may get all of my meals, cardio, and weight training done that week, if I didn’t do it according to plan (that means daily effort), then I start the same routine on the following week. I’ll keep doing this same one exercise, one five minute cardio session, and one healthy meal until I’ve successfully done what I planned to do. 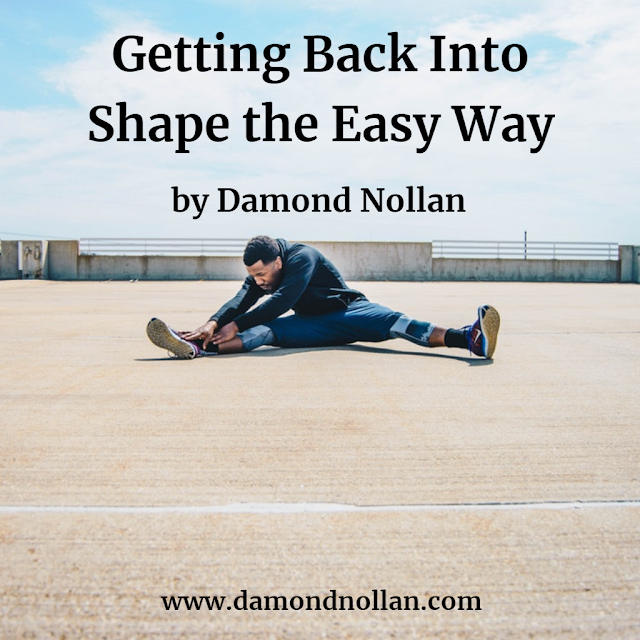 Another reason for this slow introduction is that I also give my muscles time to adjust. Yes, there will be sore muscles, but it won’t be debilitating. I also use this time to figure out my schedule. Do I workout in the morning, in the evening, or right after work? When do I cook my meals? With the slow introduction, I get to play around with moving parts until I find a time or routine that fits into my life. Once I have been able to successfully follow the plan, and this may take weeks to achieve, I then increase the intensity. Now, I add one additional exercise, which gives me a total of two. I increase my cardio by 5 minutes, which gives me 10 minutes in total. I now eat two healthy meals a day. Like before, I continue to focus on daily disciplines. While it seems easy to do, going from 15-minute workouts to 30-minute workouts is a jump. I also find that I start warming up after five minutes of cardio. As I improve my conditioning, strength, and follow through on my plans, I will continue to increase the number of exercises, minutes of cardio, and a number of healthy meals until I’m running at full speed. This process could take weeks or it could even take months. The goal isn’t to get it done the fastest, but rather to re-establish the daily habits that helped me find success years before. Where Am I At Today? To give you an update on where I am today, I have consistently been in the gym, eating right, and doing cardio for about 8 or 9 weeks. During that time, I went from the bare minimum effort to 3 exercises per body part per day, 15 minutes of cardio, and 3 healthy meals. The results I’m seeing are fat loss, more strength, and better conditioning. Eventually, I’d like to rest somewhere between 4 and 6 exercises per body part, 20 minutes of cardio (twice a day), and 4 to 6 healthy meals. Once I’m running at full speed, I am planning to be at my goal in about 6 or 7 months. That should be around September or October of this year, which, once I’m finished with this 12-week sprint, will be another two 12 week cycles. I can live with that. As I bring this article to a close, you are more than welcome to join me on this year's adventure. It won’t always be exciting, but it will be worth it. 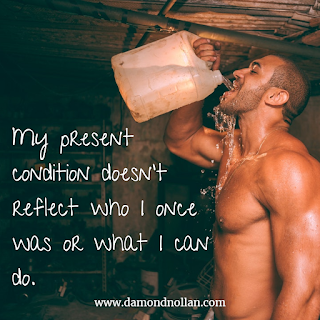 In this live video, Damond goes into depth about his current weight loss journey. He will share strategies for getting started, staying motivated, and reaching your goals.